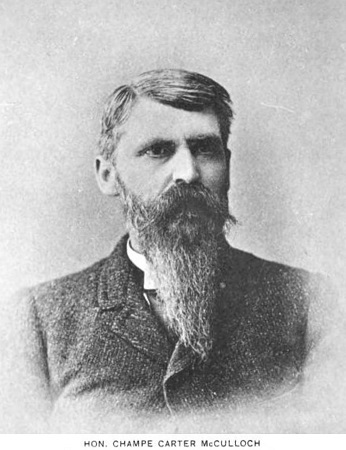 Champe McCulloch was born on the 13th of February in 1841 near Osceola, Missouri. During the War Between the States, McCulloch served with his home state’s Second Cavalry Brigade. He rose to the rank of major and saw action at the battles of Lexington, Elk Horn, Cedar Creek and at the battle of Prairie Grove where his own brother died. At the end of the War, he came to Texas like so many other veterans hoping to rebuild their lives. In Waco, McCulloch opened a grocery and dry goods store. His business model was solid but arduous, requiring him to make regular trips out to New York City where he purchased items at wholesale price to bring back to Waco and sell on the Square. Meanwhile, his wife began teaching penmanship and music courses at Waco University which soon merged with Baylor. In 1871, McCulloch’s business success allowed him to purchase a house from fellow 92 member Joseph Caldwell. Over the next several years, McCulloch built onto the home until it became the iconic multi-style home it is today. In its heyday, the McCulloch Home was recognized throughout the state as one of many houses across central Texas in which travelers could find lodging and join in various dances or social events hosted therein. The Historic Waco Foundation does a tremendous job caring for and presenting the home for public enjoyment and it is fun to think that the deal for McCulloch to acquire the house may very well have been initiated at our lodge. In 1878, McCulloch suffered a terrible loss when his four year old son was caught in the saw of a gin and killed almost instantly. Brother Champe had a widespread reputation as a hunter and shooter. He competed and won with his Tatham Gun Club team in the first annual competition of the State Sportsmens’ Association at the State Fair. His prize was a new hunting buggy, a Parker gun, ammunition, and cash. In 1881, McCulloch became a founding member of the Game Protective Association and as such he became a voice for the need to protect wildlife throughout the state of Texas. Meanwhile, his dry goods business continued to thrive and his store was located in the famous McClelland Hotel. We assume Brother McClelland gave McCulloch a very good deal for using the space. McCulloch was a rather prominent politician with some pull across Texas. More than once he was elected to various offices after having refused to run for the positions. It was McCulloch who generally oversaw the early road system of Waco as he served as chairman of the streets committee for many years. He was elected as mayor several times near the close of the 19th century. In 1893, Mayor McCulloch formally proposed and secured plans to establish a new bridge across the Brazos. The fruit of these efforts turned out to be the Washington Avenue steel bridge that remains today. Its construction was completed just a few years before his death in 1907.